It’s the Year of the Pig – but why? February 5th this year is Chinese New Year. Over a billion people will celebrate the event around the world. This year, it’s the year of the pig – one of the 12 animals in the Chinese zodiac. The other animals in the zodiac are rat, ox, tiger, rabbit, dragon, snake, horse, sheep, monkey, rooster and dog. 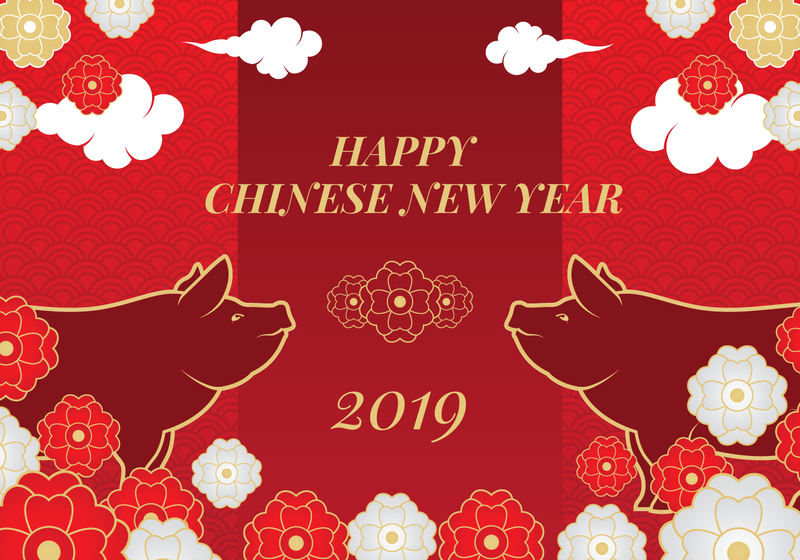 In Chinese astrology each zodiac year is not just associated with an animal sign, but also one of five elements: Gold (Metal), Wood, Water, Fire, and Earth…the year of 2019 meets element of Earth, so 2019 is year of the brown pig. Chinese zodiac animals aren’t based on the stars but have arisen as a result of a Chinese fairy tale thought to have its roots in Taoism, an ancient Chinese religion. The exact story varies from place to place and according to story tellers, but at the core, it involves the 12 zodiac animals – rat, ox, tiger, rabbit, dragon, snake, horse, sheep, monkey, rooster, dog and pig – and a race. One version of the legend says that the Jade Emperor, the ruler of Heaven and the Earth, decided to hold a race to pick the animals for the Chinese zodiac to celebrate his birthday. It’s also sometimes said that the Jade Emperor decided to hold the race because it wanted to find 12 guards to heaven, who later became the zodiac animals. In any case, all the animals in the world were invited to participate in the race and the first 12 to cross the heavenly river would be picked to be zodiac animals. At this point in time, the rat and the cat were supposedly friends, and, as the story goes, the rat was supposed to wake the cat bright and early so they could start the race together. On the day of the race however, the rat either forgot to – or in another version, deliberately didn’t – wake the cat, which is why the cat doesn’t feature on the Chinese zodiac. It is also supposedly the reason why cats have been pursuing rats ever since. For most of the animals, the race itself wasn’t an issue – but the crossing of the heavenly river proved to be a great difficulty. The rat, for one, couldn’t make it across on his own and so asked the ox for help – and the ox gladly offered it, by allowing the rat to ride on its back. But as they approached the finishing line, the rat was said to have cheated by jumping off the ox and onto the other side, thereby becoming the first animal on the Chinese zodiac. The other animals crossed the line in order of ox, tiger, rabbit, dragon, snake, horse, sheep, monkey, rooster, dog and pig, and became the next 11 animals on the Chinese zodiac, each taking one year in the 12-year calendar. In some legends, each animal is supposed to have used their special trait to help them cross the river, which is represented in the personality of the individual of that zodiac. Because it is a national holiday in Indonesia, it is widely celebrated in areas with a majority Indonesian-Chinese citizens. Not only there, but it is also celebrated in numerous different parts of Indonesian like in malls. You will be able to witness an abundance of red, gold, fruits, flowers and majestic barongsai everywhere. According to the Chinese Zodiac 2019 will be the year of the earth pig who is known to be extremely, kind, thoughtful, sensible yet realistic at the same time. ‘The Great Race’ was meant to portray the personalities of each Chinese zodiac. Based on the story, pigs are laid-back, innocent, simple-minded but also focused and diligent at the same time. More often, they are known to be the zodiac sign that is compassionate and quite naive, making them easy to fool in real life. In actuality, gullibility and naivete are just masks to what they are truly capable of. This zodiac sign is very responsible, making them capable of achieving their goals once it’s set. They are also one that could deal with trouble as they could stay relatively calm in these situations. Pigs are also ones to keep a sense of responsibility when finishing a task. In relationships, this zodiac sign is exceedingly patient and can endure other’s mistakes, which results in harmonious interpersonal relationships. Their pure, generous and thoughtful nature makes them ideal friends. Negatively, they can be known as immature, simple-minded, and not financially intelligent. Their pure nature compels them to act before thinking and can act reckless at times. The Chinese zodiac also varies in elements like wood, fire, earth, metal and water. 2019, in particular will be the year of Earth Pig. People who are in the year of the pig is predicted to have great luck. After a poor previous year, they will gain all the luck and prosperity for this year. Anything that the pig will be working on this year is going to result in tremendous success. The amount of prosperity and luck this year is also going to contribute greatly to their social life. Because of their kindness and generosity, many people will be attracted to get closer to the Earth pig. Since the pig itself seeks demonstrations of affection and love to soothe their sense of self confidence, all of their hopes and dreams are being fulfilled in more aspects than just being prosperous. However, the pig must also be aware of people who are leeching off their joyful and generous personality. Finding the difference between true friendships and people who are taking advantage of your will save you a lot of heartache and pain. Tigers are the pig’s most compatible partners. The brave personality of a tiger will give pigs the security that they need. Rabbits, on the other hand, will be attracted to pig’s warmth and intelligence. Pigs will also enjoy the company of goats who share the same interest and topics. Find your year of birth to discover your Chinese zodiac animal sign – it’s worth double checking though, as Chinese New Year falls on a different date each year so, depending on the time of the year you were born, you might be a different zodiac. A prosperous year full of happiness and many new opportunities especially those born in 1960! A great year for Ox and a perfect year for new prospects to make money or change career. A mixed year and normally you are not fazed by events although this year you will probably find you will need to adjust and be more considerate to others. A good and exciting year in 2019! A mixed year although with placing all your annual Feng Shui cures and enhancers all will be well. You will have to put some effort in this year but following our advice, you will do well.